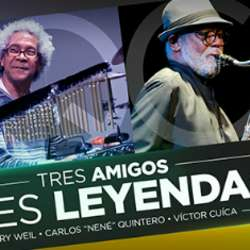 Gerry Weil, Carlos "Nené" Quintero and Víctor Cuica, three of Venezuela's leading Jazz musicians will entertain us this evening. Tickets range from 8,000bsS to 12,000bsS. Please add a comment below if you have a preference for particular seats. Given the current security situation, we will buy tickets on the day, in case of cancellation or transport difficulties. Meeting at 4.00, we will buy tickets, then go across the road to El Leon for a coffee before the show, which starts at 5.00pm.